Craniomandibular osteopathy (CMO) is usually seen in young, growing West Highland White, Scottish, and Cairn Terriers. This condition presents as swelling of the lower jaw (mandible). Diagnostics, including blood work, jaw x-rays, and biopsy, help rule out other causes for jaw swelling. The condition resolves on its own at around 12 months of age. Treatment is directed at controlling pain with anti-inflammatory medications. 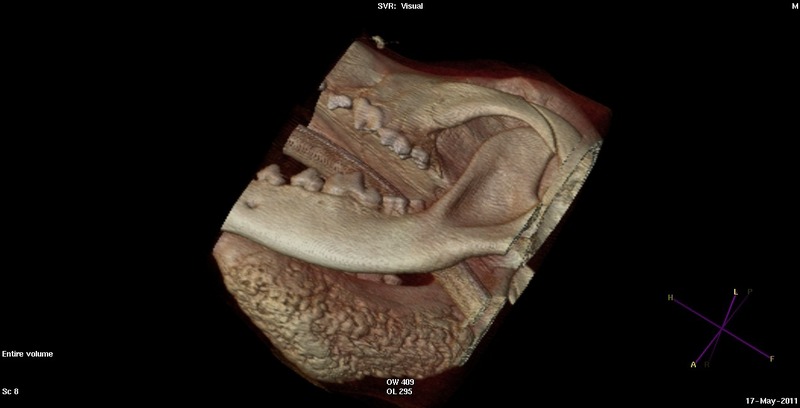 The image seen to the left is a reconstructed CT image of a dog with CMO. Thickening and irregularity of the right lower jaw (seen toward the bottom of the image) is seen. The left mandible is normal.